In 1907-17 biologist Vitaly Khakhlov was engaged in fauna researches in vicinities of lake Zaisan in Central Asia (Eastern Kazakhstan near to former Russia-China border). There he paid attention to stories of local residents and those from near regions of Western China about an unknown primate named in Kazakh as “ksy-gyik” . It was interpreted to him as “a wild man”. Khakhlov had compiled data collected from various sources in a comprehensive picture and the first from European scientists had given the scientific description of this unknown creature, yet not having in hands any exemplar of it. He did not considered it as completely valid because it was an own interpretation of stories of semiliterate peasants. However, confidence of story-tellers and conformity in their judgements with animal biology had led V.Khakhlov to belief, that an unknown human-like animal really exist in the area. "It was important to establish, whether its foot is a hind hand of an anthropoid, that only reminds a human foot, or it is the human foot with a lot of primitive features. Therefore I spent a lot of time to solve out this question. It was necessary to be convinced whether Kazakhs which took ksy-gyik for a human are right ”. As a result of comparison of some descriptions V.Khakhlov came to conclusion, that the foot of ksy-gyik looks like to that in picture Fig.1. Fig.1. The top view of ksy-gyik foot after Vitaly Khakhlov . "Legs of wild man are entirely covered by hair, except for callous formations on knees and bare soles. 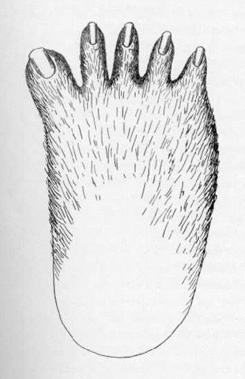 Observers emphasized similarity of wild man’s foot with that of a human, but told about its unusual width, near 18 cm and more, and widely pointed toes. For better show the narrator laid his palm on the ground, bent two end phalanxes at four fingers and moved such fingers as wide as it was possible. He pressed the thumb at beginning along the palm, but he put aside the end of it. He marked also that heel on the sole is very similar to edge of human palm ¾ it was very wide. Asked about length of the foot, he added to heel once more length of the palm. The observer showed this feature also by a print of his palm on the ground. The told above did not cover whole description. Both observers showed on their bare legs how the leg of the wild man looked like. They stressed that three inner toes were identical and protruded at end of the foot. The little outer toe was little bit shorter and is slightly pointed aside. But the big toe was appreciably shorter and larger than others and was set aside. This feature showed remarkable difference in wild man foot from that of a human and gave some hint to a hand form, though this hint was very vague. With widely pointed toes and great width of whole foot, the main features of a foot view may be considered as determined. 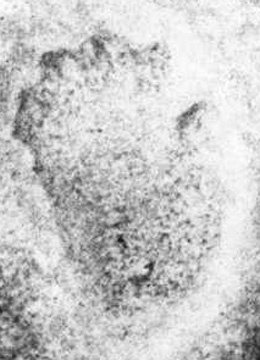 After question how wild man foot gives press on the ground, observers answered that its tracks remind those of a human dressed in ichigi (ancient kind of not high soft boots without heels, that were usually put on bare feet ¾ M.Tr.). This feature points out that the foot of wild man has flat sole and reminds a beast paw, i.e. in this respect it also significantly differs from a human foot." For the new reconstruction of ksy-gyik foot I have most precisely repeated the actions done by the local observers in front of Vitaly Khakhlov. I received a print from my hand on the damp ground and photographed it. After that I got a contour of the print shown on Fig.2A. Fig.2B shows the received contour clear from soil with heel part marked by dotted line because shift of my palm in this direction was rather arbitrary. Apparently, when Khakhlov received from local peasants a similar to Fig.2 image of ksy-gyik foot, he corrected it, as it may seem to him, to greater reality, i.e. to the form of a human foot. 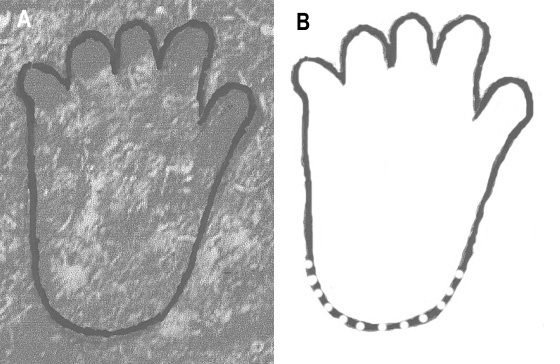 However, data on hominoid footprints available now show, that Khakhlov’s informants were quite exact in details and their pictures represented some kind of tracks, that are similar to those, met and photographed later in the Himalayas (E.Cronin ¾ Fig.3 [2,3], etc.). In the photo by E.Cronin the big toe finger is removed rather further from a line of other toes to middle of the foot, than in the reconstruction. In other aspects the precise similarity of the two is quite seen. Fig.3. The track found out by Himalayan expedition led by E.Cronin. New foot reconstruction for Central-Asian hominoid ksy-gyik allows to assume that this animal is identical or very close to some hominoid that lives in the Himalayas. 3. Trachtengerts M. On a foot type of a Himalayan hominoid, "Natural and Technical Sciences" 2004, Iss.2, p.143-145.